You know how you can just tell from the start when something is going to be good? That’s how I felt when Barb first contacted me about her daughter’s bridal shower. It was a Kate Spade themed shower, so that was my first clue. 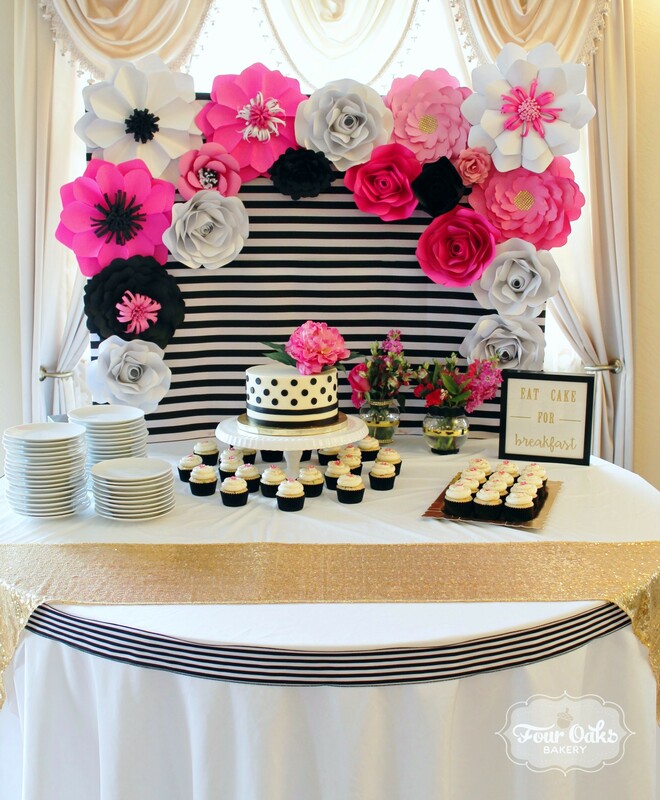 Bright pinks, metallic gold, and crisp, clean black and white stripes. It’s modern, yet classic at the same time. Nevermind the fact that Barb told me that she wanted the cake table to be “fabulous” and serve as a centerpiece to the celebration. 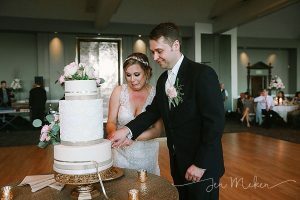 We went back and forth a couple of times on the size and design of the cake before we decided on a single tier of almond cake with vanilla buttercream on the inside and on the outside of the cake. 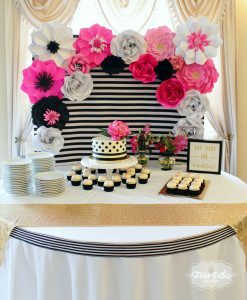 We incorporated the Kate Spade theme through black and white stripes and dots made from fondant and then one large, bright pink statement flower on the top. 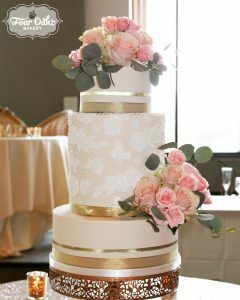 The cake sat on top of a gold cake drum that was finished with a gold ribbon around the edge. It’s these finishing details that truly elevate the cake and make it truly special and worthy of “centerpiece” status. To make up the remaining servings for the shower guests, we added a couple dozen cupcakes (funfetti!) with vanilla buttercream. 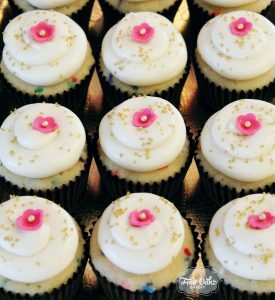 I coordinated the cupcakes with the cake by sprinkling them with gold coarse sanding sugar and then topping them with small pink fondant flowers with gold painted pearl centers. Typically, I use white paper liners for all of my cupcakes, but I decided to pull out all of the stops and went with a black liner for these cupcakes. I think that they made all the difference! 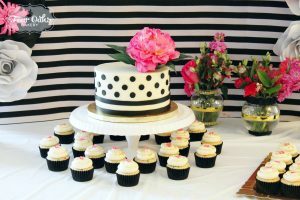 The black liners really allowed for the cupcakes to pop and stand out against the white tablecloth. You may or may not know that I have three boys. My middle son, especially, loves playing in the dirt. It’s almost as if there is a magnetic pull that draws him to dirt. Then it goes straight to his face. I cannot keep him away from it. So, I am pretty familiar with all things dirt, rocks, and construction vehicles. 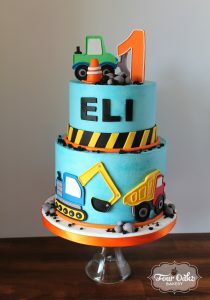 When Julianne told me that they were leaning in the direction of a construction theme for her son, Eli’s, first birthday, I knew that it was right up my alley! Dump trucks, excavators, and bulldozers–I know them well. Julianne gave me free reign with design (yay! ), so I went to work getting the cake idea in my head down on to paper. Eli’s birthday cake was two different flavors. 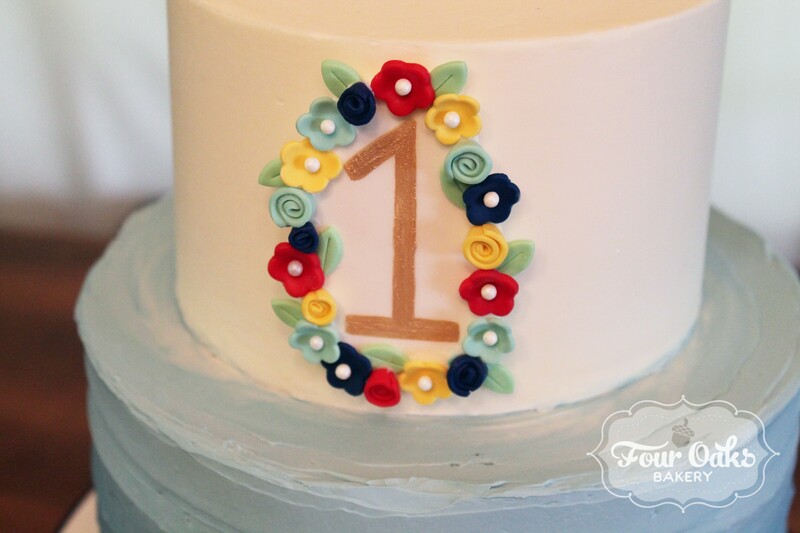 When you’re only turning one year old, you don’t have much of an opinion when it comes to cake flavors. This is a total win for the parents! 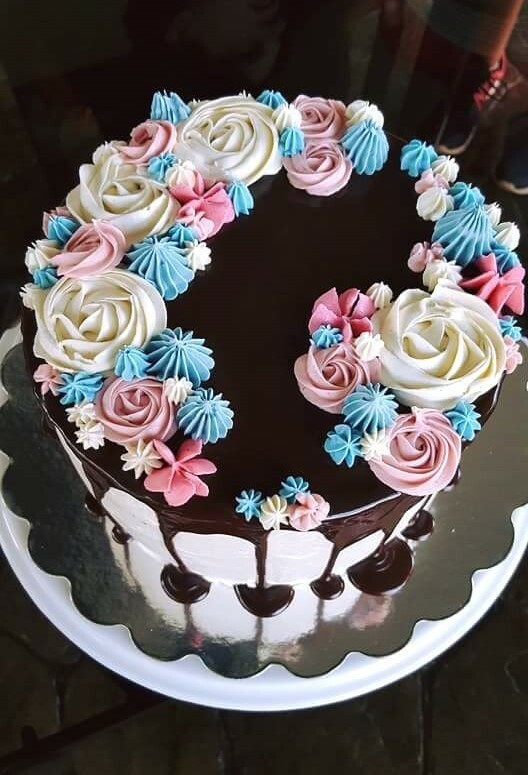 Mom chose chocolate with salted caramel buttercream and dad chose almond with raspberry buttercream (they also added on lemon cupcakes with blackberry buttercream, my fav!). 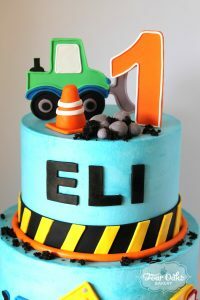 The outside of the cake was vanilla buttercream that I colored blue to look like the sky and to serve as a color contrast to the typical construction colors–black, yellow, and orange. 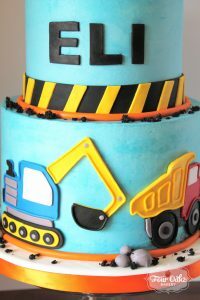 All of the decorations, including the construction vehicles, were hand cut or hand shaped out of fondant. The “dirt” is actually just what cake decorators and designers call cake scraps. When building a cake that you want to have nice, clean, crisp edges and a flat top, you generally have to trim off some cake from the top to level it. The cake that is cut off is your cake scraps. The baker and her family LOVE the cake scraps and they don’t hang around for very long (and I’m totally NOT speaking from experience here…*wink, wink). In this case, I knew that I needed to use some of the chocolate cake as “dirt” for the outside of the cake, so I forced myself to set some aside. When I was ready to add the “dirt”, I simply crumbled the cake and sprinkled it on top of the “rock” piles and then in a few places around the cake edges. Then I ate the rest of the cake scraps. 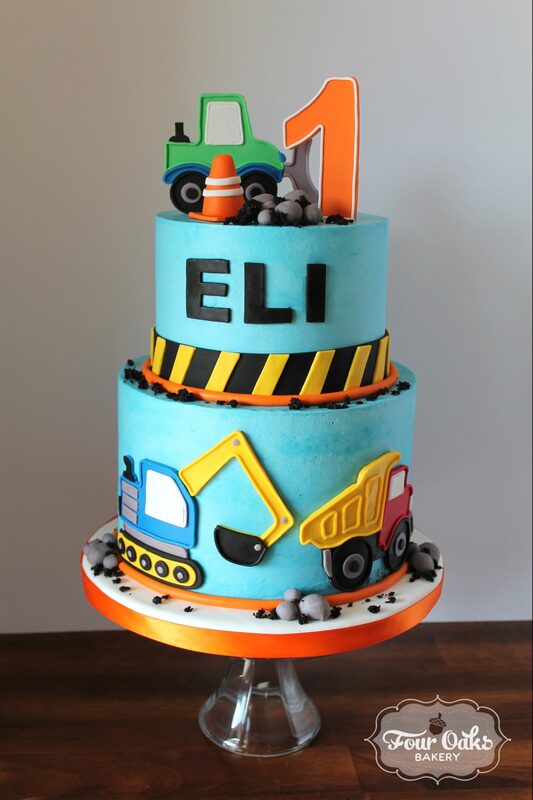 Eli, I hope that you had a fantastic first birthday and that your friends and family loved celebrating with you! To say that I am obsessed with this cake would be an understatement. 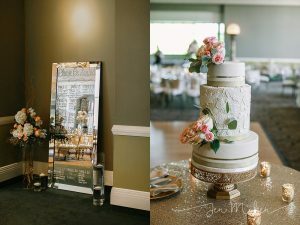 Nearly one month after Courtney and Luke’s wedding, I am STILL in love with the cake that I designed and created for their special day. 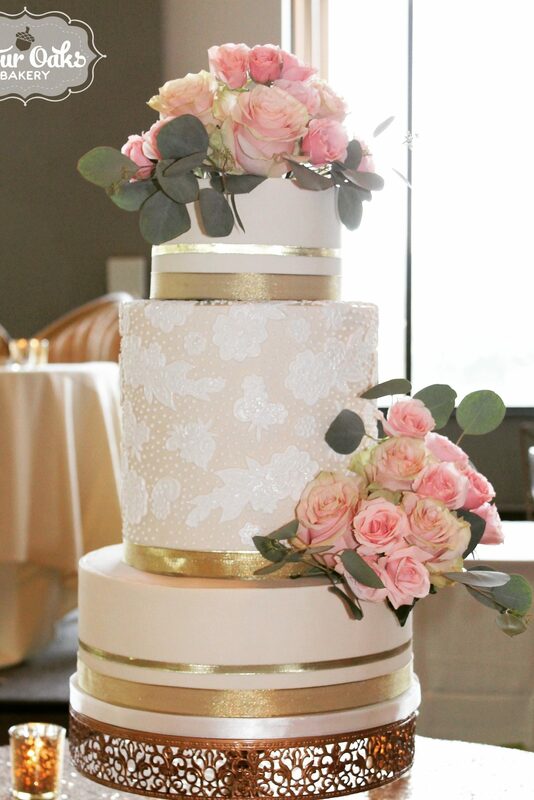 At our consultation, Courtney described the feel of their wedding as being “simple elegance.” She shared several pictures of cakes that she was drawn to for one reason or another and then told me to take the inspiration and run with it– a cake designer’s dream come true! 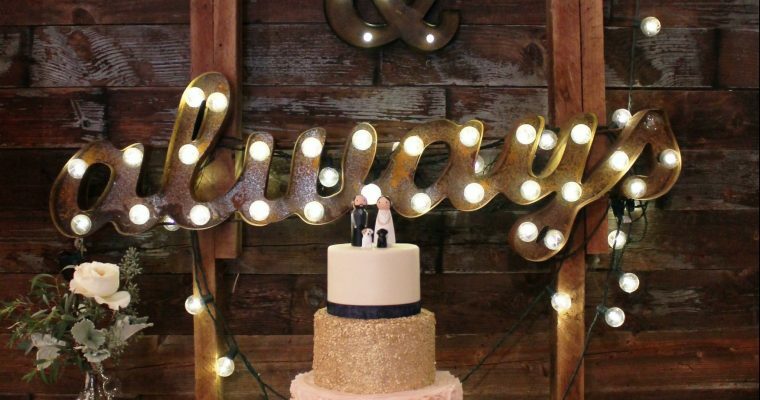 Based on the details of the wedding that Courtney shared with me and the style of cakes that she loved, I knew that the cake had to be modern, yet classic at the same time. The three ivory tiers satisfied the classic requirement and the middle tier, a double barrel, added just the right amount of modernity to the cake. We also wanted the cake to have amazing details, but still simple. We didn’t want too much going on. Again, the middle tier to the rescue! 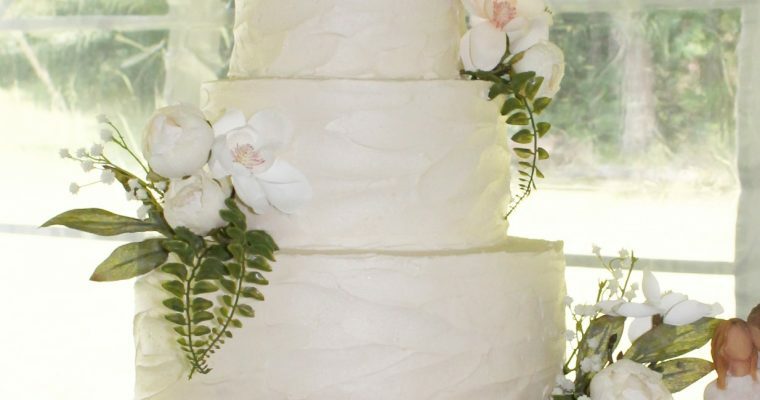 I kept the top and bottom tiers (vanilla cake with salted caramel buttercream–to DIE for!) 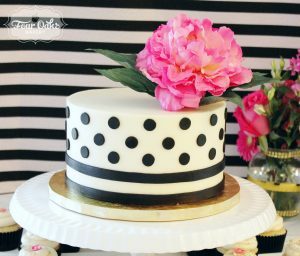 simple with the ivory fondant and gold ribbon, while adding the intricate details to the middle tier (funfetti cake with vanilla bean buttercream–so FUN!). 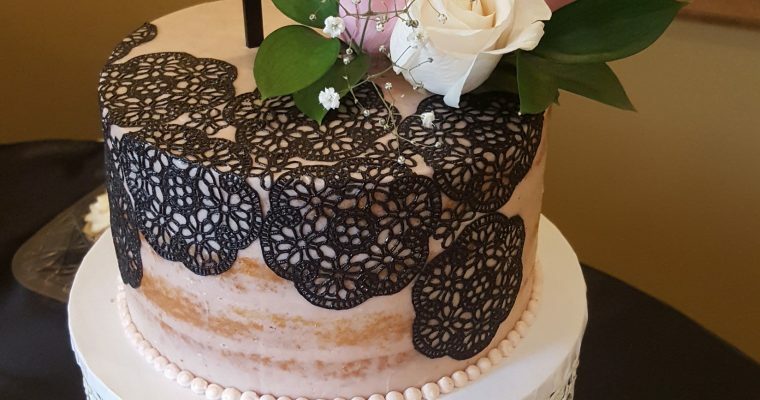 Courtney’s dress was covered in lace, so I took inspiration from that and used silicone molds made from real lace appliques. 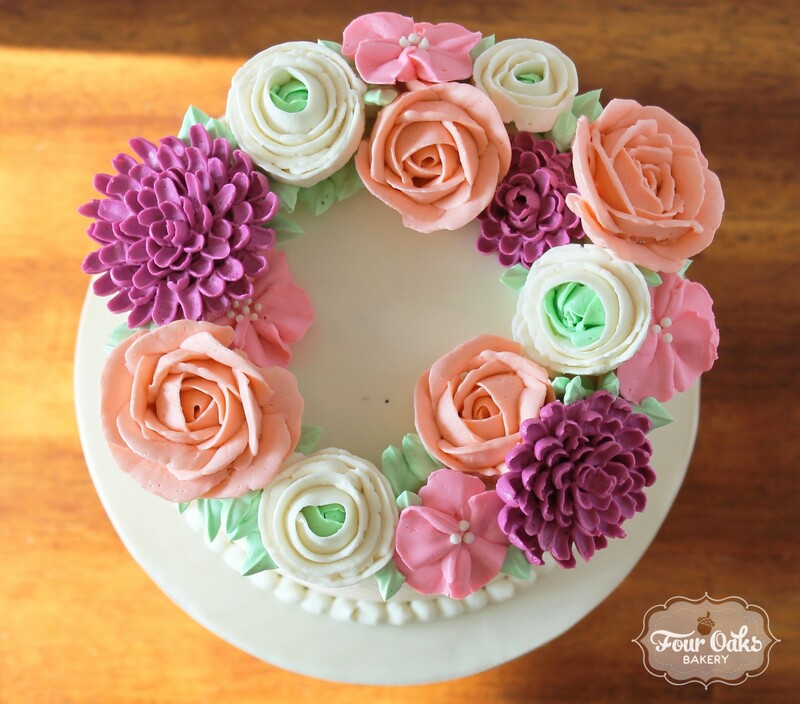 By pressing fondant into the molds, I was able to create edible lace applique for the cake. 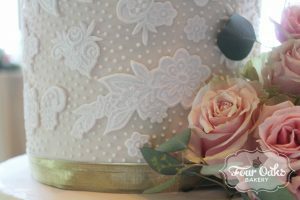 The look was completed by hand piping dots of royal icing in the empty space around the applique. This was a heavy cake! I love this picture of Courtney and Luke cutting the cake. When I asked her what she was thinking at this moment, Courtney said, “I was thinking about how I didn’t know how to cut a cake!” Haha! I don’t think that there is a wrong way! Congratulations, Courtney and Luke! 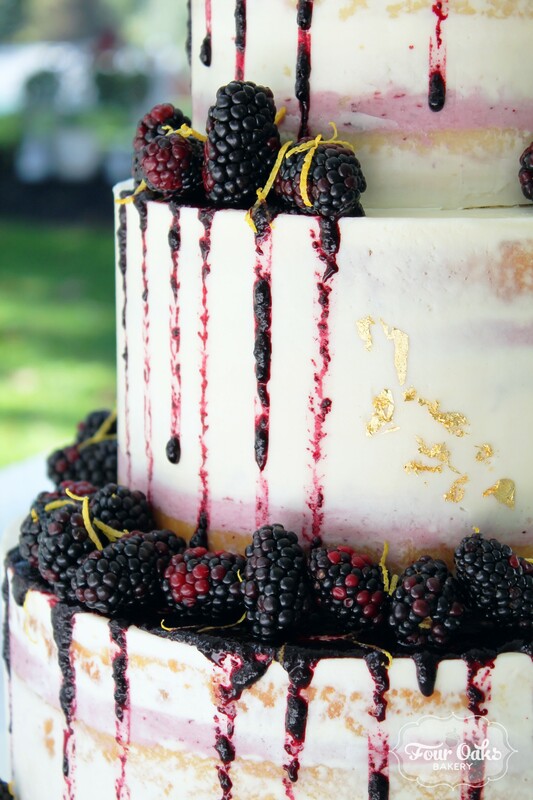 I was honored to create the cake that you shared with your guests to celebrate your wedding day!